On the world market, there is a great demand for many types of metals, and sometimes it’s more than there are supplies of those metals to fill the demand. All metals have value, some more than others. For example, let’s look at lead, which is currently selling for about 2/3 the price of copper. Lead is a good example of a metal with intrinsic value which people recognize. Most people know what lead is when they see it, and most know what they can do with it. 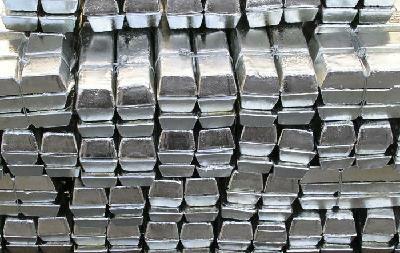 Like silver and copper, lead is very useful in industry, and like other metals its price has gone up. The USA has only one functioning lead mine left, and the rest of the lead consumed in the USA is either recycled or imported. Lead is needed in a vast number of things and in large amounts, such as car batteries and ammunition. During a time of high inflation, as the US dollar drops, American raw material resources will still be in demand on the world market. No matter what, metals like lead will still be in demand. Lead can easily be turned in for scrap to quickly generate cash in whatever is passing for legitimate government issued currency at the time. It can also be bartered or sold to other people. When barter is the dominant form of exchange, such as during a time of hyperinflation of the official currency, useful metals such as lead become a form of inflation resistant cash. Lead is something which many will always have an immediate need for since it’s used for one of the most useful products ever made – bullets. In fact, you can add value to your lead by storing them as bullets, buckshot, bird shot, etc., ready to be loaded up as ammo. This gives you an extra avenue to convert your metal to cash when you need to. Lead will always have an intrinsic value, especially as times get worse, because it’s useful, people know what it is, and it’s hard to counterfeit. FDR also never issued an executive order confiscating all privately owned lead. While the price of lead may not skyrocket like gold, it won’t crash like it either. Gold has wildly crashed before, so has silver, and investors got sheared like sheep. Can you remember ever hearing of a ‘lead crash’? The whole point of buying weighed ingots and rounds of metals isn’t speculation but stability, something gold and silver investors tend to forget sometimes. You want to lock up saved cash in an asset that is stable, inflation resistant, and quickly convertible back into to cash. All metals tend to be that way, not just gold and silver. What sets gold and silver apart is that they tend to be more highly speculative than other metals. Let’s look at the numbers. Unlike gold, most people can afford to buy lead ingots. Lead is currently about 2/3 the price of copper, and more compact. It is very dense. You can currently buy small, stamped, five pound ingots of lead, as cash allows, from places like ACE Hardware for about $19. Unlike gold, there are no commissions from dealers, no record keeping of the purchase, just local sales tax. A 100 pound stockpile of lead ingots is 20 ingots and its worth about $380 in today’s currency. During hyper-inflation, $380 in currency might get a loaf of bread or a candy bar. However, those metal ingots will most likely still convert into a current cash value equal to what $380 used to buy. You have just protected $380 from inflation and that wealth will be there when you need it. That could be enough to get you food, gas, and a host of other necessities, which just saving your money as currency wouldn’t have been able to do. You can also get your own lead ingot molds from those who sell bullet casting supplies like Lee Precision (see the ammunition reloading chapter) and ‘mine’ your own lead from local scrap. You can even stamp the weight of each little ingot you make. Just be cautious of fumes and molten lead is hot, so be careful. Lead is one way to start yourself on the road to self-employment in your own cottage industry. Get some bullet molds and go into business. With Corbin swaging equipment, lead, and some copper tubing, you can even make your own jacketed bullets. During WWII, when the supply of jacketed hunting bullets to civilians got cut off due to war needs, the Corbin family got wealthy making them as a home business. © Plan B Writer’s Alliance – Permission to copy and reprint this article is given so long as reference to the original author and the website http://www.locustsonthehorizon.com are mentioned. Jim was a travelling man, and he was free like few are. Half White and half native Shoshone, Jim grew up in rural Idaho and he knew what freedom was. He also knew there was more to life than the rat race. When he turned 18 he was a natural for the US Army to recruit, so he volunteered and eventually wound up in the Republic of Vietnam with the Special Forces. After a particularly fierce fight with regulars from the North Vietnamese Army, Jim wound up back in the USA, with a permanent limp and missing an eye. Twenty five years later, in the early 1990’s, Jim decided that he had enough of the daily grind, and he wanted to spend more time seeing America. He had been teaching survival courses and his students volunteered to help him make his travelling rig. Almost everything in the project was scavenged or bought second hand. His gypsy wagon was an old Nissan pickup that had been rolled and the engine and transmission had already been salvaged from it. They took the crushed body off the frame and kept the hydraulic bake system and the parking brake intact. They made a wooden wagoner’s seat on the front with a wooden pedal for the brakes. They then used scavenged lumber and corrugated roofing metal to build a covered gypsy wagon on the old pickup frame. Into the gypsy wagon they put an old woodstove, built a bed, and constructed storage areas, including a hidden, lockable compartment to store his guns. A deep cycle RV battery was put into its own wooden box, and hooked through a small regulator to a small solar panel. This powered an automotive cabin light inside the gypsy wagon, an old donated 40 channel CB, and a scavenged AM/FM car stereo. Mounted on the back of the gypsy wagon was a steel whip style CB antenna, and near the front was mounted a scavenged car radio antenna. His ‘motor’ was a team of three burros, harnessed side by side. The harnesses were made from old, discarded fire hoses. The rig rolled on old castoff car tires that wouldn’t have lasted 20 minutes at road speeds on an automobile, but at burro speeds, they were good pretty much indefinitely. The three burros were strong enough together that if they didn’t feel like stopping, and sometimes they didn’t, they could tow the entire rig with the brakes locked and the tires skidding. A small trailer using bicycle rims and tires was made and was towed behind the gypsy wagon. The entire small trailer was a chicken coop for small bantam chickens. On top of the chicken coop, Jim kept a container of chicken feed and a couple of bales of hay for the burros for when grazing was sparse, such as when they took a break alongside a desert road. So, at the breathtaking speed of three miles per hour, Jim saw America, lived the life, met people wherever he went, and had more than one argument with the highway patrol, mostly about travelling alongside the shoulder of the road on the interstate. The last we saw Jim, it was 4th of July, 1994, and he was camped out near the base of Kachina Peaks, just outside of Flagstaff, Arizona. His goal was to head back to where he grew up, on the Salmon River in Idaho. His guess was it was going to take three months, more or less. He wasn’t in a hurry, because the journey is what mattered, and the destination was just part of that. At this time in the course of things, most everyone has read numerous articles and books about a severe crisis occurring, a worst case scenario. They use terms like ‘SHTF’ (S*** Hits The Fan) and other acronyms like ‘TEOTWAWKI’ (The End Of The World As We Know It) or ‘WROL’ (Without the Rule Of Law). A common speculation by many is that civilization as we know it will collapse, the government just won’t be there, and most people will die from the hoards of the starving, unprepared ‘sheeple’ acting in fatal desperation as they pour out of the cities, ravaging the countryside. This has been a constant theme of ‘survival’ talk since the 1960’s and Hollywood itself took this train of thought and ran with it, making movies like Mad Max and it’s kind. So, when the Plan B Writer’s Alliance took on the ‘Locusts on the Horizon‘ project, we all did a lot of research on what really happens during a severe crisis. What we found, after studying many these events is that all too often, these popular perceptions, common to preppers and others, is more of a creation of Hollywood than reality. One thing history shows is that governments seldom just disappear unless destroyed by brute force due to an invading army or a revolution. Even then, they are usually replaced by another authority with armed men to back them up. In fact, governments in a severe crisis typically become harsher and much more willing to use brute force. More often than not, the government not conveniently disappearing is actually a significant part of the problem which people during any prolonged crisis are commonly faced with. No economic crash alone has ever destroyed a modern government and it’s bureaucracy, leaving a country in a state of pure anarchy. This is the case no matter how bad it gets, even to the point of the complete destruction of the national currency. Such events just makes governments more brutal and willing to bend or ignore their own laws. This is true even with countries that have had to lop more than twenty two zeros off of their inflated currency (Zimbabwe, land of the $110,000,000 bottle of beer), or governments that had to simply abandon their currency and issue a new currency pegged to the currency of a foreign nation (Yugoslavia circa 1994). In post WWI Germany, the inflation was so bad at one point that housewives were heating their homes with bundles of worthless money. Yet, the country didn’t turn into Mad Max. Eventually, however, they did wind up with a dictator and an overly forceful government. Famines don’t destroy national governments either. There is always some food to be had, and the first at the dinner table are always the ruling elite plus the troops and enforcers which keep them in power. There are a couple of good examples of this, one being how chubby and well fed Mao and his cohorts stayed during the Great Famine of China (aka ‘The Great Leap Forward’). Another was how Lenin and his ruling elite stayed fed and warm in Moscow during the famine winter of 1919-1920. One thing we found is that rural people in a fixed location often suffered worse than those in the cities during a famine. A key reason for this is that all too often what tends to happen is that the government first restricts travel, especially into and out of the cities. They essentially lock down their power base. Cities are usually a power base, farms seldom are. The government then sends an overwhelming force of well armed troops and enforcers into the countryside to strip it of food, like locusts, and bring it back to the cities. Does that mean the cities are the best place to be during such a crisis. Absolutely not. Cities in such conditions tend to have their own, special, mixed bag of misery ready to dish out to everyone. If you look at the executive orders of the US Federal Government and the preparations they have been making (the US Federal Government is the Ultimate Prepper), it’s become apparent that this plan to restrict travel and locust the countryside is what they plan on doing if things look like they might get too bad. After all, it’s been done before, and it works. Have you noticed how modern freeways these days look like they were designed to be traffic choke points to restrict travel if necessary? That is because they are. You can seal off and heavily restrict travel into, and out of, most major American cities nowadays with a surprisingly small number of well armed troops. One of the assumptions we have encountered a lot is that there will be a huge, mass die-off. A die-off rate of 80% to 90% is often speculated for such events. So, let’s look at some of these horrific events that have actually happened and see how much of a population die-off they actually had. What kills most people in the world, crisis or not, are two things, hunger and disease. This is typically the case even during the middle of a war. In Somalia, an artificial country created by retreating colonial powers, the central government was destroyed in a tribal civil war, and different regions fell under the sway of one warlord or another. The well publicized famine which accompanied this event killed 4.6% of the overall population. As typical in these events, the very old and the very young were hit the hardest, and 10% of that country’s children under the age of five perished. The Holodomor in the Ukraine, a horrific, artificial famine engineered to kill as many Ukrainians as possible, killed 25% of the population. The Great Hunger in Ireland in the 1840’s saw that country’s population reduced by about 25%, with about 1.5 million killed and another million emigrating on ships. In China the famine of 1958-1963, which is the worst famine on record, killed approximately 45 million people, which was about 4% of that country’s population at the time. History shows that during times of famine, most people have died at home or in their villages, and the rest were often limited in their mobility. This was because by the time it became apparent that they needed to leave to search for food, they were either too weak to travel, or the government was restricting travel at the muzzle of a gun. People who are starving have a very limited range which they can travel before physically giving out. One of the scarier trends that became apparent while studying multiple famines is just how rapidly cannibalism starts to appear during times of extreme hunger. Oddly enough, history has shown that cannibalism and modern civilization seem to be capable of co-existing during a crisis, and they are not mutually exclusive. On the website SHTFschool.com a man named Selco talks about how he survived the one year Siege of Sarajevo in the 1990’s. It was horrific and his insights are very valuable. The urban misery caused by a military siege of a city is in a class by itself. As human caused events go, a city under long term military siege is about as bad as it can get in a city, short of hitting it with a nuclear weapon. It has the combined effects of an economic crash and a famine, plus the nasty extras that come with war. The one year Siege of Sarajevo was nasty, complete with famine, the loss of electrical power for most people, and a complete breakdown of public utilities, the medical system, and law and order. Of the city’s estimated population at the time of the siege of about 380,000 people, 11,541 died, which was a die-off of roughly 3% of the total population. The worst die-offs often come from disease, especially contagious pandemics. Pandemics typically kill more than wars do. The worst pandemic to ever hit Western civilization was a bacterial infection commonly known as the bubonic plague (the ‘Black Death’) which peaked in the mid-1300’s. That pandemic killed about 33% of the population of most of Europe, though some regions were spared, most notably Iceland and Poland. A more recent, notorious pandemic, the Spanish Flu of 1918, swept the world rapidly and killed an estimated 3% to 5% of the world’s population at the time. The deadliest, widest ranging war fought to date was World War Two, which killed an estimated 72 million people. That was about 3.27% of the world’s estimated population in 1938. One of the big assumptions that are made when discussing a severe crisis event is that people will enter a state of animalistic panic and they will stay that way till they die a miserable death from being unprepared. When events initially start, it’s not uncommon for people to panic at some point, such as if they suddenly realize at that something bad and unexpected is about to effect them and they feel unprepared to meet that threat. Examples of this would be things such as an enemy army is coming, or they find out they might not get any more food from a supermarket or an emergency aid center, and they have nothing stored. A classic example of panic amongst a large number of people creating a nightmarish situation is what happened during the ARVN evacuation of the Central Highlands near the end of the Vietnam War. Another classic panic example was the Fall of Saigon at the end of that war. Both of these, like the majority of the horrific evacuation stories in history, were typically not a result of economic collapse or famine, but of war and it’s aftermath, such as the mass relocation of Germans after WWII, or the forced march of ethnic Chinese out of Vietnam after the Fall of Saigon. Panic, however, does not last indefinitely in those stricken with it. Panic is the result of a human survival mechanism, one of several built into all of us, and it’s only temporary. As any crisis wears on, there comes a point in these events where things like hunger and exhaustion kick in. Then human adaptability combined with the individual cleverness inherent to the human critter overrides panic and mindless fear. Then people adapt, and adapting is what the human critter is all about. This is one of the key reasons why there is usually a definite curve on the death toll in such events, especially those that drag on a while. Humans can be very resilient and resourceful when pushed hard enough. Throughout history, nomads have usually weathered a severe crisis better than those around them, and they are typically very adaptable, both in mental outlook and in lifestyle. This is also why they are some of the oldest surviving cultures still existing. Because they are adaptable they can use or discard both new or old technology as they see fit. Because they are durable as a culture, their traditions and family households have survived generation after generations. This is true whether they are the Bedouins of Arabia, the Sea Gypsies of Burma, or the herders of Mongolia. Most of all, they have also been the freest people on Earth. A mobile people are a free people, and they are usually the hardest segment of any nation’s population for authoritarian governments to track or control. This is why we took the path that we did with ‘Locusts on the Horizon‘. If the situation remains a economic crunch, then people will still have a dwelling for their household for any length of time pretty much anywhere, and a means to travel to find work. If it gets really bad, at the first whiff of it, families so equipped can retreat to as remote and inconspicuous of area as possible, maybe even banding together, several families at a time if need be. This is also a plan your average, middle class, working family can actually, realistically afford to do. However, best of all, it gives a lot of good people their best shot at remaining alive and free when events take a turn for the worst. History has shown us that not only do these events occur periodically, but they are quite survivable, even if all you have going for you is dumb luck. History also shows that even a basic level of preparation, planning, and foresight can dramatically increase your odds of pulling through, or even prospering in such events, while simultaneously greatly reducing your potential for misery. Sometimes, famine is caused by times of crisis when those who are in power start shipping so much of the remaining food off to keep themselves, their troops, and their enforcers fed that those who are not vital to keeping their regime in power become disposable. In early 1917, Czar Nicholas II of Russia abdicated his throne, and his appointed successor, Grand Duke Michael, declined to accept the throne until the people were allowed to vote through a Constituent Assembly to decide whether to continue the monarchy or create a democratically elected republic. Lenin’s Communists had other ideas. In October 1917, they staged a coup in the capital of Russia and deposed the legislature. However, that was only the beginning. Russia still had a lot of people who opposed the Communists, aka the ‘Reds’, including whole armies (the ‘White’ armies). So began the nightmare of the Russian Civil War which killed 7 million people. Of those 7 million deaths, roughly 5 million were from starvation. Even though parts of the Russian Empire had been considered to be some of the great bread baskets of the world, both the continuance of large scale agriculture, and the distribution of its output, was badly disrupted. Some places under control of the ‘White’ armies or the allied expeditionary forces sent into Russia (which included American troops) still had supplies coming in from the West. However, in areas under Communist control, what little there was in cities like Moscow usually got shipped off to feed the Red Army, or feed the elite who were running things and the local enforcers which kept them in power. As the war raged on, famine was becoming a growing concern for everyone across a country which spanned eleven time zones. Cannibalism was becoming a problem in some places and the public execution of cannibals who were caught didn’t seem to stop the practice. 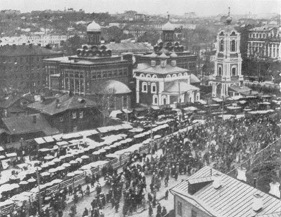 In Moscow during the winter of 1919-1920, the food situation was so bad that Lenin and his Communists allowed the continued existence of a large open air black market bazaar which everyone called the ‘Sukharevka’. The Communist government didn’t shut the Sukharevka down until 1925. The Sukharevka, 1920, there were no stalls or booths. The trading and deals were simply hand to hand. One journalist described the Sukharevka that winter as “a crowded study in need and greed”, where ANYTHING could be had – for a price. Even Lenin admitted that without the Sukharevka, Moscow would have starved to death that winter. The only cash tendered at the Sukharevka was either barter, or gold and silver. Gold and silver got you much more bang for your buck than barter. If all you had was barter, you were basically at the mercy of the food merchants who always got what you had for a small fraction of its worth. However, even those with gold and silver (usually Imperial coins denominated in rubles minted during the Czarist era) found that the prices were astronomical. In the fall of 1919, a single pud (1 pud = 36 US pounds) of flour cost between 6,000 to 7,000 gold rubles. A late Czarist era 5 ruble gold coin was .900 fine and contained .1245 troy ounces of gold. So, 6000 gold rubles would be 1200, five ruble gold coins, at .1245 ounces of gold per coin. At a price of 6000 gold rubles per pud, that’s the equivalent of 4.15 troy ounces of gold per US pound of flour. In modern exchange, with gold in mid-2012 fluctuating around $1600 per ounce, that’s around $6,600 in current US dollars per pound of flour, payable only in gold or silver, and that was before the real winter even set in. In mid-November 1919, one man reported that he was able to buy 10 eggs and 4 pounds of soap for 1000 gold rubles (24.9 troy ounces of gold). By mid-January millet had risen to 9,500 to 10,000 gold rubles per pud. In modern American measurements, that’s 6.57 to 6.91 troy ounces of gold per pound for millet. Six weeks later, at the beginning of March, flour had risen to 13,000 to 15,000 gold rubles per pud (9 to 10.375 troy oz. of gold per pound of flour) and millet had risen to 16,000 to 17,000 gold rubles per pud (11 to 11.75 troy oz. of gold per pound of millet). For those living in the city, the choices were few and grim. You either paid the price for the food, or you starved. The other options included banditry, cannibalism, or scraping the wallpaper paste off of the walls and using sawdust to make whatever food was available go a little further. Fuel was almost in as short of a supply as food. To get caught stealing or vandalizing to get wood for fuel in Moscow could easily result in a summary execution. Oddly enough though, the Communists running Moscow did manage to keep the electricity on somewhat through much of the winter, enough for lighting at least. It let everyone know that Lenin and his gang were still in charge. One university professor kept from freezing that winter, after he ran out of fuel for his stove, by building an insulated hut in the middle of his cramped apartment with mattresses. He ran a power cord to the hut and kept as warm as he could with a light bulb. However, the shortage of food almost killed him anyway. To put the inflated famine prices of food that winter into perspective, in mid-2012 gold was fluctuating around $1600 per troy ounce. That meant that by March, during that winter of famine in early 1920 when food was at its most scarce, ordinary flour was going for the modern gold equivalent of around $16,000 per pound. That’s right, $16,000 for a single pound of flour, simple, ordinary flour like you find in the grocery store, and payable only in gold or silver. That is the same flour which you can currently find in stores like Walmart for about $1.80 for a 5 pound sack. That 5 pound sack of flour, normally worth $1.80, suddenly became worth $80,000 in gold. That is a 4.4 million percent inflation rate on food. Remember that guy who paid 24.9oz of gold for 10 eggs and 4 pounds of soap? That was in November before the famine got anywhere near its worst. That’s the modern equivalent of about $39,800 for 10 eggs and 14 large bars of soap. That’s $39,800 worth of gold, not inflated paper currency. Currently, single 50 pound bags of whole grain wheat can often be had from various sources for between $25 and $50 each. The wheat can keep almost indefinitely if properly stored. When ground into 50 pounds of flour and sold under the conditions which existed at the Sukharevka in 1920, that single sack of wheat could become worth over $800,000 of today’s purchasing power, payable only in gold and silver. As the Federal Government plays ‘creative bookkeeping’ with the unemployment figures, even more families plunged into poverty during the past year and now there are estimated to be over one million homeless school children. Meanwhile, the Federal Government will spend over $1 Billion this year on the air travel, luxury vacations, and lavish parties of the President and his family. Across the country, thousands of unprepared Americans who have been thrown into homelessness are seeking shelter in the warrens of tunnels beneath America’s cities. These are drainage tunnels, abandoned subway lines, old utility tunnels, etc. Under the streets of Las Vegas alone there are 200 miles of drainage tunnels with an estimated 1,000 inhabitants. Many of these inhabitants are entire families, including those with infants. The same is happening in tunnels under other American cities, such as New York and Kansas City. Michael Snyder, author of the novel ‘The Beginning of the End’, wrote an excellent article about this on his blog at the following link.